The Windrow shifter from Ashmore Engineering has been designed to serve two purposes. Firstly, shifting wet windrows across to dry ground through a baler-type pick up process aerates the hay without inverting the windrow. This reduces the amount of excess weathering and bleaching to the materials. The Windrow shifter also reduces the need for raking and therefore the possibility of contamination of windrow by ground refuse. There are two models available, a single or a tandem unit. The single unit shifter is able to offset a single windrow at a time from 0’ to 16’ either side of centre. 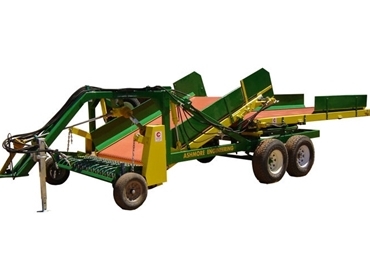 The single unit is also capable of creating a single windrow by combining 2 windrows that are up to a maximum of 30’ apart. The tandem unit can offset 2 windrows at the same time, up to 6’ either side of centre. It took can create a simple windrow by combining 2 windrows at a time that are up to a maximum of 16’ apart.